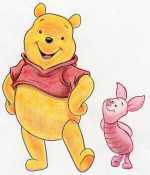 So, let’s learn how to draw a pig. This is a very simple tutorial. 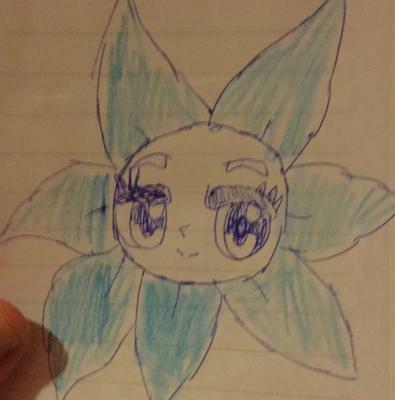 I made it made only in pencil. I hope you’ll enjoy it. It’s very interesting, how virtually any object you chose to draw, can first be composed of circles, ellipses or squares, etc; and then you give it a final shape. The very same is with this pig drawing. I understand that for a complete novice it is often a bit difficult to make imaginary circles, ellipses, etc, within the body of the drawing object. That is the way we need to train ourselves, train our eyes and brain to see objects as artist do. 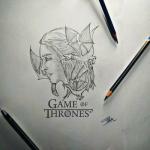 When you get accustomed to use this technique you will be able to draw even the most complicated objects. Actually there are many different kinds of pigs and it was a little hard to decide which one would fit best for this tutorial. Some pigs have longer snout, some have shorter; some are very fat some are not so fat…well, I chose to draw this piggy. 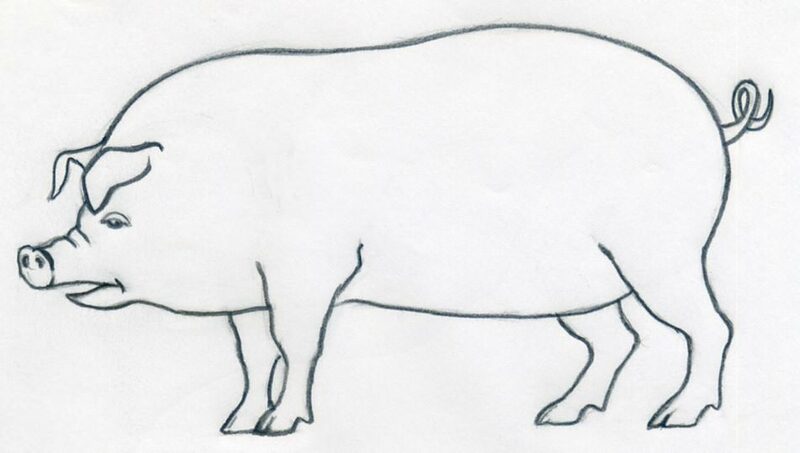 So if you want to learn how to draw a pig, then please first draw this one. 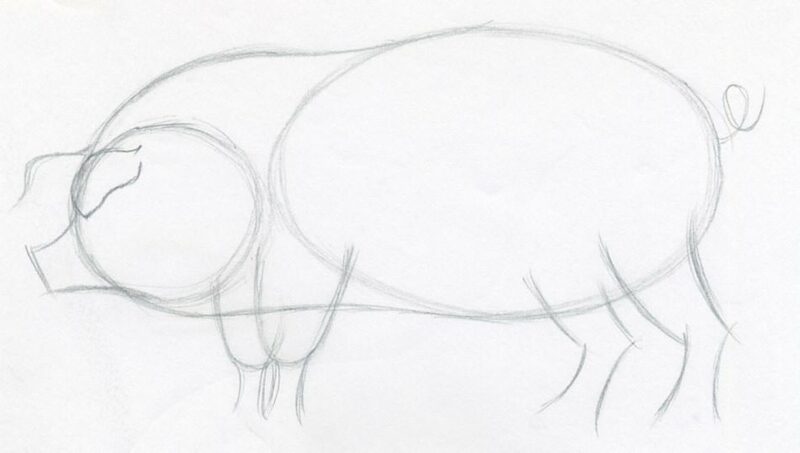 By practicing this simple pig drawing you will get the idea how it works. It is easier than you’ve ever imagined. 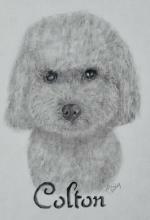 The first step is always to observe well the object you are going to draw, observe every detail very carefully. 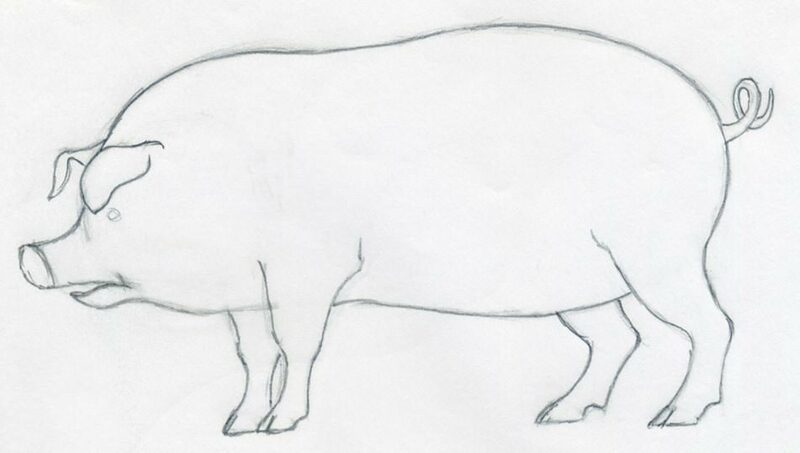 Fortunately this piggy is a super simple drawing, I would say it is rather a sketch than a drawing, so you can make it very quickly. 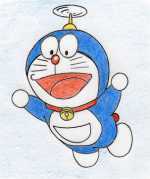 Draw one larger ellipse and one circle approximately in the same or similar position as you see on this picture. The oval or ellipse is the pig’s body and the circle will be the pig’s head. Enlarge the picture and see that both ellipse and the circle are made of many pencil strokes. 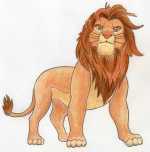 Sketch the outline of upper part of all the four legs as you see on the picture. Do not draw the whole length of the legs or feet yet because you don’t yet know the total balance of the body. Here, we can join the large ellipse and the circle together and get an approximate shape of the pig’s body. Draw similar joint lines to connect the large ellipse and the circle – the head. 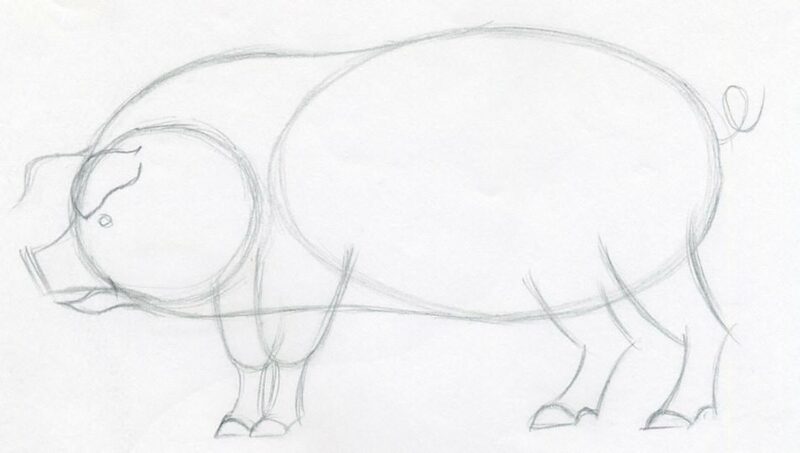 See, this is only the third step and you are already getting the idea of how to draw a pig. In fact we are only a few pencil strokes away from the completion. The reason is, that if you first outline the snout then you can get the idea how big the ears should be. Then you will better understand how to sketch the lower part of the legs, the feet. Finally, the tail will serve as an accent to complete the total balance of the body. Outline the shape of all four feet, place the eye on approximately the same place as you see on the picture. Draw the pig’s open mouth. 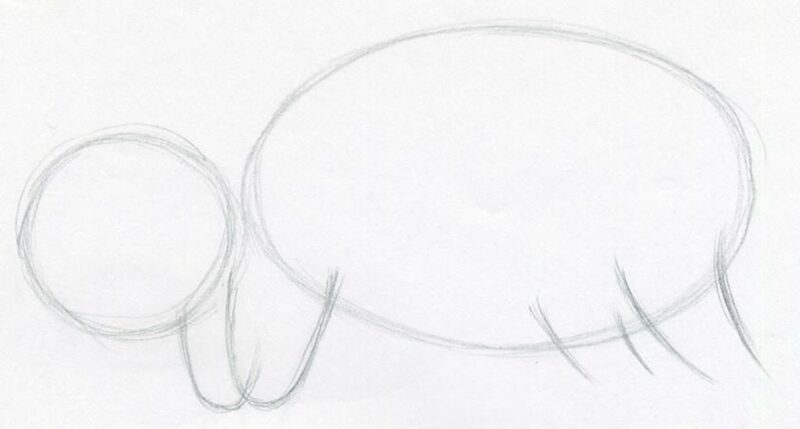 It’s time to gradually give this piggy drawing a final shape. You can start erasing all unnecessary pencil lines. When erasing narrow spaces you can use a pencil-type-eraser as usual. 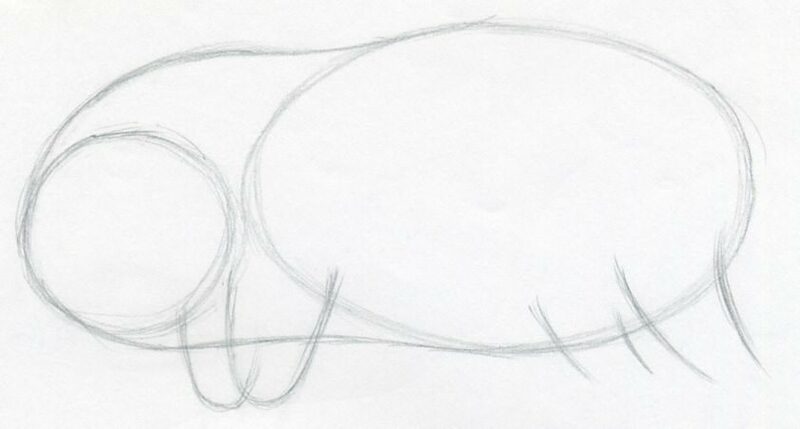 Draw the final shape of legs, ears, snout and the tail. Keep on erasing all unnecessary pencil lines as you proceed with the drawing. If you have a softer pencil 4B, 2B or so you can outline the contours of the entire body as you see on the picture. If you don’t have soft pencil available then standard HB pencil will be OK too. Now you have a complete outline of a pig’s body in total good balance. You can go on and color it if you like. 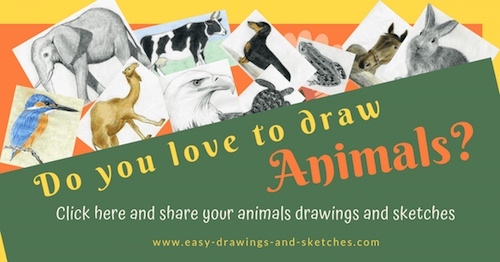 Please upload your drawing – click on the banner below, we all would love to see it. I am sure you did an awesome job! 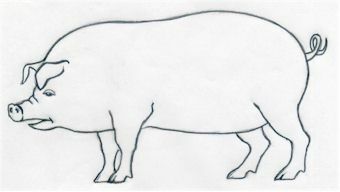 You can teach your friends or family members how to draw a pig. They will be surprised for sure!